The Millennium Starts With Scream! After the wickedly original thrills of 1996�s Scream, the filmmakers trod on shaky ground by making a sequel. It may have been inevitable, since Scream performed well at the box office, but it could have been disastrous. However, while 1997�s Scream 2 wasn't as good as its predecessor, it still offered some fun action. Scream 3 seems roughly equivalent to Scream 2; both appear slightly tired at times but they also deliver enough cheesy excitement to make the trip worthwhile. There's no way the freshness and cleverness of the first film could ever be replicated, as that picture's self-referential style has been duplicated up the wazoo; what seemed new and original in 1996 quickly became somewhat stale. That doesn't mean that Scream 3 falls flat, but it has to work much harder for its thrills. The film seems somewhat forced, as though everyone's trying desperately to reinvent the wheel but no one knows how to do so. Honestly, the Scream legacy would have been better served if no actual sequels appeared. So many imitators have appeared that the second and third films have a lot of trouble distinguishing themselves from the crowd, and in some ways, their failings cheapen the creativity of the original. Despite the feeling that I'd walked this dog before, I still enjoyed Scream 3 to a moderate degree, which is pretty much the same way I felt about Scream 2. As I reflect on Scream 3, there's not a lot about it that stands out as especially memorable. It's much more lightweight entertainment than the first movie, which became etched in my mind because it was so different; while well-told, the action of Scream 3 seems largely generic and little looks particularly clever. Realistically, two aspects of Scream 3 carried me through the film. For one, no matter how far into "Scooby Doo" territory the plot went, I remained curious to discover how the story would be resolved. As with the prior movies, a wide range of possible killers exists, and we receive very few clues as to that person's identity. After three films, I'm involved enough in the fates of our main characters that I want to see what will happen to them. Three veterans of the other two pictures - Neve Campbell's Sidney, David Arquette's Dewey, and Courtney Cox's Gale - reprise their roles, so it�s fun to see how their characters would deal with the new threat. None of those actors provides particularly inspiring performances; to be frank, they all seem a little tired and they probably hoped the flick would mark the end of the series. That brings me to Scream 3's other redeeming feature: Parker Posey's performance as Jennifer, the actress who plays Gale in movie-within-a-movie Stab 3. Posey provides an absolutely hilarious turn as an actress who's just as self-centered and career-obsessed as the "real" Gale, and the scenes in which Posey and Cox face off in Battle of the Galest Gales make for some of the film's best parts. Actually, the most memorable part of Scream 3 comes during the silly moment in which a frazzled Jennifer climbs into the arms of her bodyguard (an underused Patrick Warburton). Posey manages this feat in such a pathetic manner that it creates a tremendous laugh where none might otherwise have existed. Few other portions of Scream 3 manage to rise above the crowd, however. Overall, I found the movie to be fun and entertaining, but the bloom is clearly off the rose. Director Wes Craven and crew managed to squeeze a little more life out of the formula, but there's no more blood for it to lose. Scream 3 appears in an aspect ratio of approximately 2.35:1 on this Blu-Ray Disc. This was a lackluster transfer. Sharpness was fair. Much of the movie showed good delineation, but wide shots tended to be tentative and soft. The presence of edge haloes affected these elements and left the picture without the clarity expected. No issues with jagged edges or shimmering occurred, but I thought the film took on a �digital� look, and some print flaws also appeared; I noticed a few small specks. Colors were natural but could be a bit too warm. They tended to veer toward the dense side and weren�t as accurate as I�d like. Black levels generally seemed adequate, while shadow detail looked a bit murky and vague at times; low-light shots didn�t display great accuracy. Enough of the image looked good enough for a �C�, but this wasn�t an impressive presentation. I felt more pleased with the DTS-HD MA 5.1 soundtrack of Scream 3. The soundstage appeared appropriate, and for what it did, the audio worked quite well. Most of the sound stuck to the forward channels, but it expanded nicely to the rears much of the time, and a fair amount of discrete audio appeared. The mix featured some excellent panning as well; the soundfield seemed more involving just because the audio moved between speakers so smoothly and neatly. Audio quality was positive. Some lines could be a little edgy, but most seemed natural and concise. Music sounded clear and precise, with accurate highs and deep lows. Effects offered realistic - or hyper-realistic, when appropriate � reproduction that never displayed any distortion. The track's dynamic range seemed solid, and the whole piece packed a solid punch through its tight bass. This was a positive auditory presentation. How does this Blu-ray compare to the original DVD? Audio was a bit peppier, while visuals seemed somewhat clearer and more accurate. However, the visual drawbacks meant this wasn�t as much of an upgrade as I�d like. Most of the DVD�s extras reappear here. First up is an audio commentary from director Wes Craven, producer Marianne Maddalena, and editor Patrick Lussier. All three sit together for this running, screen-specific look at story/character topics and changes from the original script, sets and locations, cast and performances, music, editing, and connected areas. The track provides some good details, but there's too much superficial discussion of what we can already see on the screen. The participants point out a few interesting bits � editor Lussier appears to have a rather good memory, and he mentions a lot of the inconsistencies that boneheads like me always miss - but all in all, the track seems a little slow. It's worth a listen, but it lacks some entertainment value. Next up are some video features. Outtakes lasts six minutes, 34 seconds and presents a mixture of the usual flubs and goofiness. For some reason, I found these to be a little more entertaining than most, but they stick with the typical formula. A Behind the Scenes montage shows up here. This goes for six minutes and 20 seconds and presents production snippets from each of the first three Scream films; they all receive fairly equal time, which means roughly two minutes per movie. These are a lot of fun, especially those for the first picture; it's too bad they only included such small bits, as I would have enjoyed much more. The Deleted Scenes section gives us four excised portions. The first two actually are the same piece; they're different versions of the opening of the film. Alternate One runs four minutes and 25 seconds and essentially just adds footage to the existing opening, while Alternate Two goes for six minutes and presents an different version of the scene. The other two deleted segments are shorter - 110 seconds and 75 seconds, respectively - and also add footage to already-existing scenes. The extra footage is mildly interesting; the two openings weren't terribly good, but the others were a little more compelling. One complaint: during the main commentary, we hear of lots of deleted material, but little of that appears here. I especially would have loved to see Posey's other takes of the bodyguard scene I mention earlier; the commentary states that she did all sorts of great stuff, but we have no visual evidence. Didn't anybody save the other takes? Another unused scene gets its own section: the 10-minute, two-second Alternate Ending. Don't get too excited about this; it's not very different from the existing conclusion. It adds a little and does a few things mildly differently, but the overall piece works the same, and there are no significant differences. All of the "Deleted Scenes" and the "Alternate Ending" can be viewed with or without commentary from Craven, Maddalena, and Lussier. Although they add nothing tremendously fascinating, their remarks add some perspective about the pieces and let us know why the changes were made. The disc includes a music video for Creed's "What If". This clip differs slightly from the typical "video for a movie" format. Yes, it features the normal lip-synching scenes, but the video tries to maintain a story as well; it uses David Arquette as movie studio security and shows the band and some babes as they're terrorized by the Scream killer. It's nothing special, but at least it's a little more clever than the usual crummy videos we find attached to movies. The disc opens with ads for Scream 4, Lionsgate horror and the Saw series. These show up under Also from Lionsgate as well. 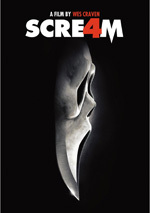 In addition, the Blu-ray provides two trailers for Scream 3 and 13 TV spots. Ultimately, Scream 3 offers enough fun and thrills to deserve a viewing, especially from already-established fans of the series. However, no one should expect more than a fairly wan imitation of the wonderful original. The Blu-ray presents good audio and a generally positive set of supplements but picture quality seems mediocre and compromised. This is still the best home video rendition of the movie, but it could�ve been much better.